This dish offers a lot of complex flavors without too much fuss. While the grapes are the star ingredient, they blend in nicely with the other flavors and don’t totally steal the show. The steak is marinated with sumac and toasted coriander seeds, then seared and sliced thin. Farro adds a hint of nuttiness and is dressed with a simple vinaigrette. Then the mix of roasted and fresh grapes takes adds the unique character that makes me look forward to this every year. If you can find muscat grapes, definitely use those. They taste like dessert wine – sweet and floral. Otherwise, use your favorite grapes and add a little wildflower honey to them as they roast to give them that extra pop of flavor. This recipe may look like it has a lot of moving parts, but it isn’t too difficult. 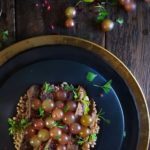 While the farro cooks, you can make the dressing, roast the grapes, and sear the steak – then it’s all done by the time the farro finishes cooking. A lot can be prepped ahead and then you just have to sear the steaks and roast the grapes – perfect for guests! Steak marinated overnight, then quick-seared and paired with farro and roasted grapes. Grate the shallot. If you don't have sumac, zest 1 lemon. Grind the coriander seeds and toast them (it sounds overly fancy, but it's worth it for the extra flavor. Otherwise, use 1 tsp ground coriander). To toast them, heat a small pan to medium and add in the Coriander seeds, whole. Stir them around until fragrant, usually only a couple minutes. Do not take your eyes off them or they will burn. Combine all marinade ingredients in a bowl to form a paste. Cut the skirt steak into 6 inch lengths and rub the paste all over. Seal and refrigerate. Farro: Follow the directions on your farro packaging to get the right amount of water. Add salt to it - enough that it tastes like salt water (trust me, it makes a big difference to the flavor of the grain and it won't be overly salty). Cook for as long as the package says, usually between 25 and 40 minutes. If you are an overachiever, when the farro is done, drain it and spread over a sheet pan. Throw in the oven for 5 minutes with the grapes to dry out a bit, so more of the dressing soaks in. Grapes: Place 3/4 of the grapes on a sheet pan and roast at 400 degrees (no need to wait for the preheat). Cook until warmed 10-15 minutes, you are not trying to brown them. (The unroasted grapes will be added to the dish at the end). Reduce heat of oven to keep grapes warm when finished. Pound the garlic until it's a paste, add some salt. Add the garlic to a bowl and whisk in the olive oil, vinegar, salt and pepper. Heat a cast iron pan until very hot (cast iron holds heat well after you place cold meat on it). Remove the steak from the fridge and season with salt and pepper. Add 2 Tbs of oil to the pan, add steak and cook until browned, about 3-5 minutes. Brown other side. Then lower the heat to finish cooking the steak until desired doneness (or throw the pan in the oven with the grapes). Mix dressing in with the farro in the pan you cooked it in, or a large bowl. Then put it on plates. Thinly slice the steak against the grain. Add it to the farro along with the roasted grapes, fresh grapes, and parsley. Top with fresh cracked pink peppercorns if you have them (they are slightly citrusy), and a drizzle of honey if you'd like. * Coriander seeds, toasted and then crushed are worth it. But if you don't want to buy a whole bunch for just one recipe, sub in 1 tsp of ground coriander. **1 cup of farro will yield about 3 cups when cooked. You can also use barley or another nutty grain. Portions: this yields 1/4 lb of meat per person, a regular serving (but some people like extra meat, so plan accordingly). The farro ends up at about 3/4 cup cooked, per person. Increase or decrease based on who you’re serving this to. 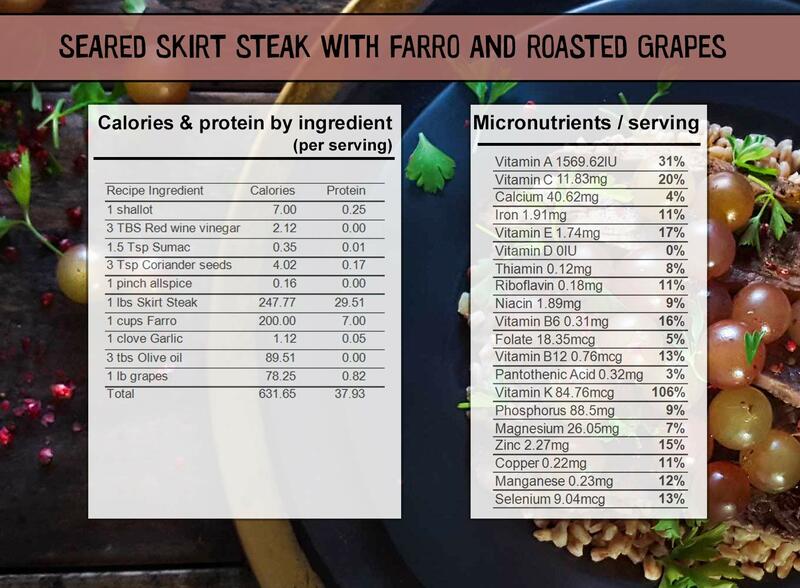 Protein: This recipe account for 75% of your daily value of protein, with the steak counting for just over 50% and the farro for just under 25%. Muscat grapes: They are hard to find, but Whole Foods often has them imported from Chile in March and April, and you might be able to find them from shipped from California in September or October (though I honestly have more luck finding them in spring). Sumac is a spice that can be replaced with lemon zest if you don’t want to buy a whole jar. However, it has a really interesting flavor and you might find yourself reaching for it more than you’d think (find it on Amazon or Penzys). Leftovers: this holds flavor well in the fridge. You can eat it cold, but I like to throw the whole thing in the oven for a bit to warm up. Salad for Dinner is becoming a favorite cookbook – which also introduced me to this sausage, lentil and kale salad with spicy mustard. It’s the most unassuming little cookbook with very few pictures. The next recipe I want to try is her arugula salad with nectarines, marcona almonds and serrano ham. « Should I buy organic?